After Britain won the Seven Years' War and gained land in North America, it issued the Royal Proclamation of 1763, which prohibited American colonists from settling west of Appalachia. The Treaty of Paris, which marked the end of the French and Indian War, granted Britain a great deal of valuable North American land. But the new land also gave rise to a plethora of problems. The ceded territory, known as the Ohio Valley, was marked by the Appalachian Mountains in the east and the Mississippi River in the west. Despite the acquisition of this large swath of land, the British tried to discourage American colonists from settling in it. The British already had difficulty administering the settled areas east of the Appalachians. Americans moving west would stretch British administrative resources thin. Further, just because the French government had yielded this territory to Britain did not mean the Ohio Valley's French inhabitants would readily give up their claims to land or trade routes. Scattered pockets of French settlers made the British fearful of another prolonged conflict. The war had dragged on long enough, and the British public was weary of footing the bill. Even after Britain issued the Royal Proclamation of 1763, Daniel Boone continued to settle areas west of the Appalachian Mountains. 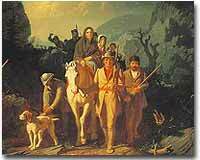 This 1851 painting, Daniel Boone Leading Settlers through the Cumberland Gap, depicts the popular image of a confident Boone leading the early pioneers fearlessly into the West. Moreover, the Native Americans, who had allied themselves with the French during the Seven Years' War, continued to fight after the peace had been reached. Pontiac's Rebellion continued after the imperial powers achieved a ceasefire. The last thing the British government wanted were hordes of American colonists crossing the Appalachians fueling French and Native American resentment. The solution seemed simple. The Royal Proclamation of 1763 was issued, which declared the boundaries of settlement for inhabitants of the 13 colonies to be Appalachia. Whereas We have taken into Our Royal Consideration the extensive and valuable acquisitions in America, secured to our Crown by the late definitive Treaty of Peace, concluded at Paris. the 10th day of February last; and being desirous that all Our loving Subjects, as well of our Kingdom as of our Colonies in America, may avail themselves with all convenient Speed, of the great Benefits and Advantages which must accrue therefrom to their Commerce, Manufactures, and Navigation, We have thought fit, with the Advice of our Privy Council, to issue this our Royal Proclamation, hereby to publish and declare to all our loving Subjects, that we have, with the Advice of our Said Privy Council, granted our Letters Patent, under our Great Seal of Great Britain, to erect, within the Countries and Islands ceded and confirmed to Us by the said Treaty, Four distinct and separate Governments, styled and called by the names of Quebec, East Florida, West Florida and Grenada, and limited and bounded as follows, viz. First — The Government of Quebec bounded on the Labrador Coast by the River St. John, and from thence by a Line drawn from the Head of that River through the Lake St. John, to the South end of the Lake Nipissim; from whence the said Line, crossing the River St. Lawrence, and the Lake Champlain, in 45. Degrees of North Latitude, passes along the High Lands which divide the Rivers that empty themselves into the said River St. Lawrence from those which fall into the Sea; and also along the North Coast of the Baye des Châleurs, and the Coast of the Gulph of St. Lawrence to Cape Rosières, and from thence crossing the Mouth of the River St. Lawrence by the West End of the Island of Anticosti, terminates at the aforesaid River of St. John. Secondly — The Government of East Florida. bounded to the Westward by the Gulph of Mexico and the Apalachicola River; to the Northward by a Line drawn from that part of the said River where the Chatahouchee and Flint Rivers meet, to the source of St. Mary's River, and by the course of the said River to the Atlantic Ocean; and to the Eastward and Southward by the Atlantic Ocean and the Gulph of Florida, including all Islands within Six Leagues of the Sea Coast. Thirdly — The Government of West Florida. bounded to the Southward by the Gulph of Mexico. including all Islands within Six Leagues of the Coast, from the River Apalachicola to Lake Pontchartrain; to the Westward by the said Lake, the Lake Maurepas, and the River Mississippi; to the Northward by a Line drawn due East from that part of the River Mississippi which lies in 31 Degrees North Latitude, to the River Apalachicola or Chatahouchee; and to the Eastward by the said River. Fourthly — The Government of Grenada, comprehending the Island of that name, together with the Grenadines, and the Islands of Dominico, St. Vincent's and Tobago. And to the end that the open and free Fishery of our Subjects may be extended to and carried on upon the Coast of Labrador, and the adjacent Islands. We have thought fit, with the advice of our said Privy Council to put all that Coast, from the River St. John's to Hudson's Streights, together with the Islands of Anticosti and Madelaine, and all other smaller Islands Iying upon the said Coast, under the care and Inspection of our Governor of Newfoundland. We have also, with the advice of our Privy Council. thought fit to annex the Islands of St. John's and Cape Breton, or Isle Royale, with the lesser Islands adjacent thereto, to our Government of Nova Scotia. We have also, with the advice of our Privy Council aforesaid, annexed to our Province of Georgia all the Lands Iying between the Rivers Alatamaha and St. Mary's. And whereas it will greatly contribute to the speedy settling of our said new Governments, that our loving Subjects should be informed of our Paternal care, for the security of the Liberties and Properties of those who are and shall become Inhabitants thereof, We have thought fit to publish and declare, by this Our Proclamation, that We have, in the Letters Patent under our Great Seal of Great Britain, by which the said Governments are constituted. given express Power and Direction to our Governors of our Said Colonies respectively, that so soon as the state and circumstances of the said Colonies will admit thereof, they shall, with the Advice and Consent of the Members of our Council, summon and call General Assemblies within the said Governments respectively, in such Manner and Form as is used and directed in those Colonies and Provinces in America which are under our immediate Government: And We have also given Power to the said Governors, with the consent of our Said Councils, and the Representatives of the People so to be summoned as aforesaid, to make, constitute, and ordain Laws. Statutes, and Ordinances for the Public Peace, Welfare, and good Government of our said Colonies, and of the People and Inhabitants thereof, as near as may be agreeable to the Laws of England, and under such Regulations and Restrictions as are used in other Colonies; and in the mean Time, and until such Assemblies can be called as aforesaid, all Persons Inhabiting in or resorting to our Said Colonies may confide in our Royal Protection for the Enjoyment of the Benefit of the Laws of our Realm of England; for which Purpose We have given Power under our Great Seal to the Governors of our said Colonies respectively to erect and constitute, with the Advice of our said Councils respectively, Courts of Judicature and public Justice within our Said Colonies for hearing and determining all Causes, as well Criminal as Civil, according to Law and Equity, and as near as may be agreeable to the Laws of England, with Liberty to all Persons who may think themselves aggrieved by the Sentences of such Courts, in all Civil Cases, to appeal, under the usual Limitations and Restrictions, to Us in our Privy Council. We have also thought fit, with the advice of our Privy Council as aforesaid, to give unto the Governors and Councils of our said Three new Colonies, upon the Continent, full Power and Authority to settle and agree with the Inhabitants of our said new Colonies or with any other Persons who shall resort thereto, for such Lands. Tenements and Hereditaments, as are now or hereafter shall be in our Power to dispose of; and them to grant to any such Person or Persons upon such Terms, and under such moderate Quit-Rents, Services and Acknowledgments, as have been appointed and settled in our other Colonies, and under such other Conditions as shall appear to us to be necessary and expedient for the Advantage of the Grantees, and the Improvement and settlement of our said Colonies. And Whereas, We are desirous, upon all occasions, to testify our Royal Sense and Approbation of the Conduct and bravery of the Officers and Soldiers of our Armies, and to reward the same, We do hereby command and impower our Governors of our said Three new Colonies, and all other our Governors of our several Provinces on the Continent of North America, to grant without Fee or Reward, to such reduced Officers as have served in North America during the late War, and to such Private Soldiers as have been or shall be disbanded in America, and are actually residing there, and shall personally apply for the same, the following Quantities of Lands, subject, at the Expiration of Ten Years, to the same Quit-Rents as other Lands are subject to in the Province within which they are granted, as also subject to the same Conditions of Cultivation and Improvement; viz. To every Subaltern or Staff Officer, — 2,000 Acres. We do likewise authorize and require the Governors and Commanders in Chief of all our said Colonies upon the Continent of North America to grant the like Quantities of Land, and upon the same conditions, to such reduced Officers of our Navy of like Rank as served on board our Ships of War in North America at the times of the Reduction of Louisbourg and Quebec in the late War, and who shall personally apply to our respective Governors for such Grants. And whereas it is just and reasonable, and essential to our Interest, and the Security of our Colonies, that the several Nations or Tribes of Indians with whom We are connected, and who live under our Protection, should not be molested or disturbed in the Possession of such Parts of Our Dominions and Territories as, not having been ceded to or purchased by Us, are reserved to them. or any of them, as their Hunting Grounds. — We do therefore, with the Advice of our Privy Council, declare it to be our Royal Will and Pleasure. that no Governor or Commander in Chief in any of our Colonies of Quebec, East Florida. or West Florida, do presume, upon any Pretence whatever, to grant Warrants of Survey, or pass any Patents for Lands beyond the Bounds of their respective Governments as described in their Commissions: as also that no Governor or Commander in Chief in any of our other Colonies or Plantations in America do presume for the present, and until our further Pleasure be known, to grant Warrants of Survey, or pass Patents for any Lands beyond the Heads or Sources of any of the Rivers which fall into the Atlantic Ocean from the West and North West, or upon any Lands whatever, which, not having been ceded to or purchased by Us as aforesaid, are reserved to the said Indians, or any of them. And We do further strictly enjoin and require all Persons whatever who have either wilfully or inadvertently seated themselves upon any Lands within the Countries above described or upon any other Lands which, not having been ceded to or purchased by Us, are still reserved to the said Indians as aforesaid, forthwith to remove themselves from such Settlements. And we do further expressly conjoin and require all Officers whatever, as well Military as those Employed in the Management and Direction of Indian Affairs, within the Territories reserved as aforesaid for the use of the said Indians, to seize and apprehend all Persons whatever, who standing charged with Treason. Misprisions of Treason, Murders, or other Felonies or Misdemeanors, shall fly from Justice and take Refuge in the said Territory. and to send them under a proper guard to the Colony where the Crime was committed of which they, stand accused, in order to take their Trial for the same. Given at our Court at St. James's the 7th Day of October 1763, in the Third Year of our Reign. Despite the Treaty of Paris, many Native Americans continued to fight against European settlement of land west of Appalachia. 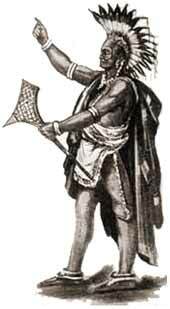 Ottawa Chief Pontiac led numerous attacks against British and colonial expansion and settlement and his violent aggression is one reason Britain issued the Proclamation of 1763. But what seemed simple to the British was not acceptable to their colonial subjects. This remedy did not address some concerns vitally important to the colonies. Colonial blood had been shed to fight the French and Indians, not to cede land to them. What was to be said for American colonists who had already settled in the West? In addition, the colonies themselves had already begun to set their sights on expanding their western boundaries; such planning sometimes even causing tension among the colonies. Why restrict their appetites to expand? Surely this must be a plot to keep the American colonists under the imperial thumb and east of the mountains, where they could be watched. Consequently, this law was observed with the same reverence the colonists reserved for the mercantile laws. Scores of wagons headed westward. How could the British possibly enforce this decree? It was nearly impossible. The Proclamation of 1763 merely became part of the long list of events in which the intent and actions of one side was misunderstood or disregarded by the other. It was on the first of May, in the year 1769, that I resigned my domestic happiness for a time, and left my family. Thus begins Daniel Boone's personal, romanticized account of his settlement of Kentucky. Read it in its entirety at this website from the Digital Archives of the National Center for Public Policy Research. 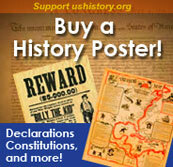 Ignoring the Royal Proclamation of 1763, many American colonists continued to venture west and create settlements. Long after the Proclamation was null and Americans gained their independence, settlers of the next century looked upon these early pioneers as role models. This American Memory Collection website from the Library of Congress explores the settlement of what would become Michigan, Wisconsin, and Minnesota. Pictures and links offer a comprehensive examination of the Upper Midwest. Issued by King George III on October 7, the Royal Proclamation of 1763 was more than a prohibition of westward settlement. The text of the entire document is presented at this Yale University website. Britain's efforts to curtail westward expansion, most notably in the Proclamation of 1763, had little impact on the American colonists eager to settle the area west of Appalachia. This Canadian website includes the text of the Proclamation and examines the effect, if any, it had on settlement in North America. The legendary Daniel Boone certainly has quite a reputation as an American pioneer and hero, but are all of the stories true? This University of Virginia website attempts to answer the question, Who was the real Daniel Boone? It offers pictures, links, and text that examine Boone's image and the various roles he played throughout his lifetime. Exactly what lands did the Royal Proclamation of 1763 declare off-limits to American colonists? This website from Native American Indian Resources examines the area beyond the Proclamation line. Maps and links complete this colorful website. What might have happened if courageous American colonists had adhered to the Royal Proclamation of 1763? People such as Daniel Boone might not have settled the West.